Arketer Labs: An Emergency Relocation, a Brief Explanation of the Name Code system and The Heat Takes Interest in Arketer Labs of Tyria. 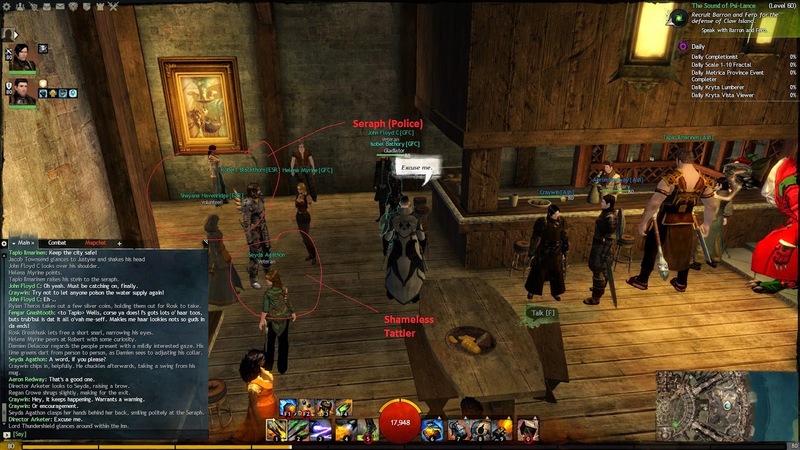 An Emergency Relocation, a Brief Explanation of the Name Code system and The Heat Takes Interest in Arketer Labs of Tyria. Not without a complication however, this week. It has become apparent that the true identity of one of my henchpeople has been compromised. Fortunately, we do have procedures in place for just such a complication. The family of said henchperson has been relocated wholesale to a new location where they are being kept safe. As far as the authorities are aware, the family has perished in that most rare of tragedies- a gas leak explosion and fire. Relatives believed likely to be grieved over the absence have been informed that said family has been moved into a witness protection program- which is not terribly far from the truth. At this point I would be remiss to elaborate on where they've been relocated to, but what I can say is that it will be up to them and the compromised employee to determine their next course of action. As the breach was caused by a moment of recklessness on the part of the employee in question (They called their family in a moment of homesickness, on an unsecured line no less.) a measure of the expenses are being deducted from their contract. I am of course sure that all other employees understand the importance of discretion, not just for the security and protection of our work but for the protection of your loved ones. Arketer Labs will protect your families to the best of our abilities, but the best protection comes from them never being endangered at all. 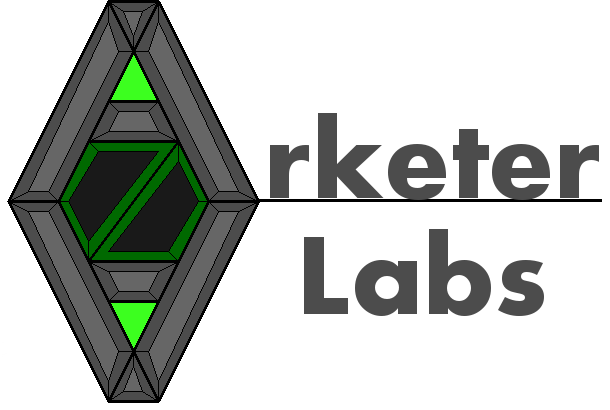 When an individual hires on with Arketer Labs they, in a certain practical sense, give up their names for the duration of their employment and are obligated to use a series of numbers as their handle with precious few exceptions. Naturally nicknames are given among familiars, but so long as these are not their actual names it's something of a non-issue. The reason for this is that despite our best efforts it is not inconceivable that third parties of malicious intent can tap into our communications or steal data from time to time. Should they then be able to determine who a given employee actually is they might then work to subvert that employee, one of the easiest routes to which is the threatening of their family or other loved ones. In more frivolous news, I found the time to try more role-playing in Guild Wars 2. In the time since I last mentioned this here I deemed it practical that Arketer Labs of Tyria would have developed working Watch Knight prototypes. Indeed, I have taken advantage of some items in 82's account to effect just such an illusion. That this would draw attention from the authorities of Kryta is only logical, which I have taken for motivation for Tyria's Arketer to undertake a campaign to try and explain the value of Watch Knights in regards to the survival of Humanity. Not... always with any particular success. Those who were under the impression Humanity was in a great position already, I resolved not to speak with as history has shown me they would rather slander me than view the situation with anything approaching objectivity. Those that did listen I understand are interested in arranging meetings between interested parties and Arketer. I hope to find time to arrange such should the requisite letters arrive. 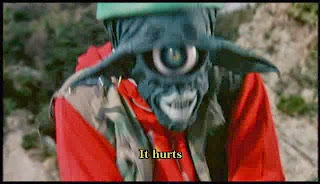 Still, worse than the characters who intentionally or unintentionally are being played as delusional are those who actively seem to hate any effort to restore the Watch Knights because, apparently, their being hijacked previously means they are somehow innately evil and bad. 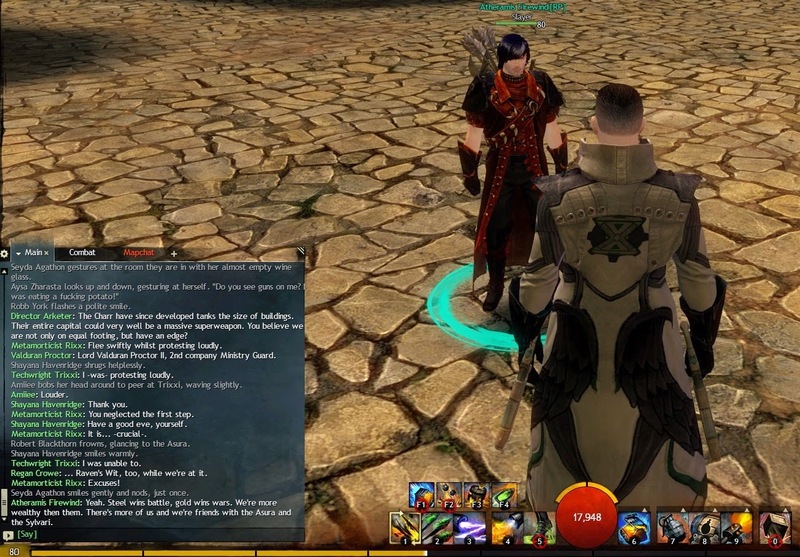 The foremost representative of this line of thought, nearly had Director Arketer of Tyria arrested by the Seraph. Having, on the first opportunity, elected to tattle on him. As you can see, I could see their intentions a mile away. That Director Arketer here could do so only seems fair. Director Arketer departed just before she could impose upon the Seraph to detain him, rushing out an accusation as Arketer made his exit. Now, on one hand the Seraph or Throne's interest I had hypothesized as being rational is at this point a very real thing (insofar as another imaginary organization is interested), so for that I quite likely owe the player of Miss Agathon some thanks. Working around this should be novel. On the other hand I cannot say I approve of the character themselves when they are apparently something of a hypocrite who is a member of an organization called The Aetherblade Connection. Aetherblades are basically air pirates who make heavy use of Asuran Inquest (slightly more unethical chibi goblins) technology. That they take issue with Watch Knights is absurd when the Inquest is known for such charming things as powering golems with stolen souls and seem to take an approach to developing technology that revolves around how much they can hurt other creatures with it. And they have the audacity to claim that Watch Knights are somehow irredeemably tainted or dangerous? 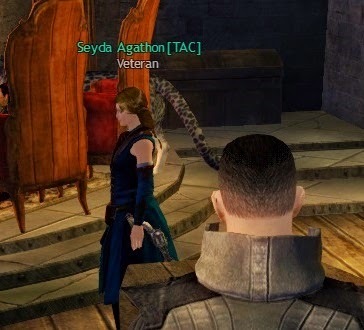 Now this is all OOC (Out Of Character) knowledge, so Director Arketer of Tyria cannot make these accusations against Miss Agathon, but as they have been rude, dismissive and have now attempted to get the Director arrested I cannot imagine he needs any further reasons to dislike them. I'm sure the player themselves is a perfectly nice individual in no position to dictate the directions of other's research and experimentation however.